"How long does a bird live?" is one of the questions that I get regularly asked. David Lack was a renowned amateur ornithologist. A teacher in South Devon he devoted his spare time in the 1930s to observing local Robins. His study led to a classic work of natural history, "The Life of the Robin" published in 1943. When addressing an audience of learned ornithologists on the subject of his studies, he said that the average life expectancy of a Robin was a little over one year. He was laughed off the stage. Everybody knew that they have had a Robin in their garden for years and they were sure that it was the same one. But he was right. Think about it for a moment - if the all the eggs laid by a pair of Robins in a season became breeding adults there should be around twelve Robins where previously there had been two. Much of the 'infant mortality' happens in the nest or shortly after fledging. In addition ringing studies have shown that the first year mortality of young garden birds, once they have fledged, is over seventy percent. Most of our common small birds have similar survival rates and life expectancies. Roughly a half of all the adult birds and nearly ALL the baby birds you see will be dead in a year's time. It's a sad thought, but the birds' breeding efforts are necessary just to maintain the breeding population. Some times there is a follow up question "Why do we not often see old or geriatric birds?" 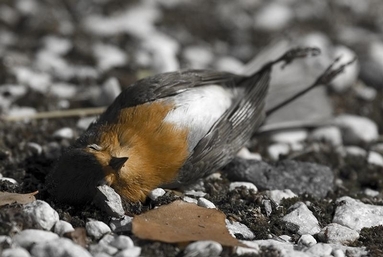 Unlike humans the probability of death each year remains roughly constant for birds. In other words, few birds die of old age -- they just run the same gamut of risks year in and year out until they are killed. The annual risk of being killed varies from around seventy percent in our small garden birds giving an average life expectancy of a year, to about three percent for an albatross giving an average life expectancy of about thirty years. Life expectancy in birds is closely correlated with size -- the larger the species, the longer it is likely to live. But the relationship is far from exact. However, generally, large birds and seabirds live longer than small birds. Just as there is a great difference between the various types of bird, there is a great difference between the average length of life and the greatest length of life. From the information on ringed birds at Euring Databank Longevity Records http://www.euring.org/data_and_codes/longevity-voous.htm , the longest lived Robin is seventeen years and three months. So, the answer to our question "How long does a bird live?" is that most adult small birds in temperate regions such as ours live for about a year, and only about 10-20% of young reach adulthood. Big birds, seabirds and tropical birds can live much longer. But some individuals of any species can live as much as ten times as long as the average - that's like an exceptional human living for hundreds of years!